The natural ravines at this state park in north Florida reach depths of 120 feet. These ravines are a nice surprise in mostly flat Florida. The historic structures at the park include two suspension bridges, walkways, trails, formal gardens, and a fountain. If hiking the steep ravines is too challenging (wear hiking shoes! ), you can drive the scenic loop through the park, where there are plenty of scenic overlooks to stop and take photos. The TreeUmph! Adventure Course in Bradenton is an entire treetop adventure. From the trees, you'll take in views of 14 acres of lush Florida scenery, with pine and live oak canopies. There are several courses at different levels of difficulty, with suspension bridges, hanging nets, swinging ropes and zip lines. This restaurant is a longstanding local landmark (although the treehouse bar is a relatively recent addition). Guests can hang out in the treetops and enjoy an excellent meal, paired perfectly with a glass of wine or hand-crafted cocktail. Note to families: The tree house section is the restaurant’s upstairs bar, so no one under 21 is permitted. 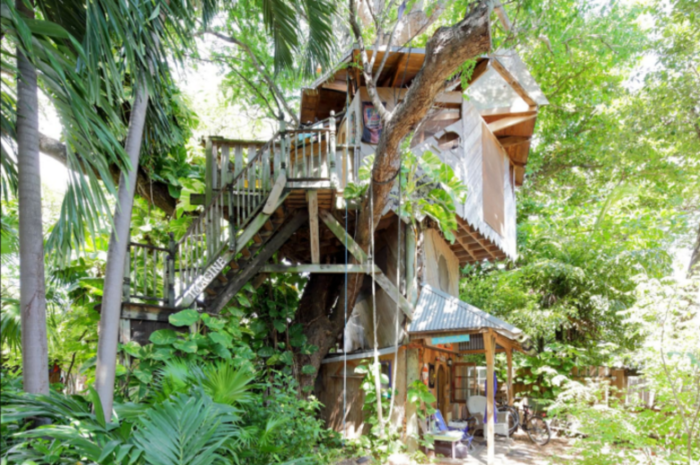 If you always wanted to have a tree house as a kid, you will love this unique Airbnb listing located on a permaculture farm in Miami. There are plenty of windows to let in the light, and, of course, your bedroom is built right around a massive tree trunk. You can look out on the surrounding foliage on one side and the tree canopy on the other. The Brevard Zoo's Treetop Trek has something for everyone. Choose from several different courses, from an easy obstacle course perfect for kids to a Treetop Challenge for the thrill-seekers. Challenge yourself with these tests of strength and skill, including a suspended bike and skateboard challenge. There's also a zip line course that includes soaring 40 feet in the air on a large zip line. The canopy walk at this state park was the first of its kind in Florida. It was designed to reach the level of the treetops, so visitors feel like they’re walking through the trees. The park's observation tower, however, is 76 feet tall, so that is where can get the best views. This charming cottage in the trees is full of romantic rustic details and every amenity you could ask for, including a mini kitchen and even a fireplace. Guests will also appreciate the beautiful view of Coldwater Creek through the treetops. On site, you'll find a grill, fire ring and picnic table. If you're the more adventurous type, Adventures Unlimited also offers a Zip line experience that will really get your adrenaline pumping. This 243-acre park in Broward County has nature trails, picnic shelters, and three playgrounds, making it very family-friendly. The park's lush tropical setting gives you the feeling of walking a jungle. Climb up into the canopy on the 28-foot-tall observation tower and check out a birds eye view of the lush scenery. How many of these treetop adventures have you experienced? What’s your favorite way to explore the Sunshine State? Older Post Get Your Motor Running!